When last we met on this topic (almost 4 years ago – hem-hem), Len Uhley and I were still trying to hash out the cast. 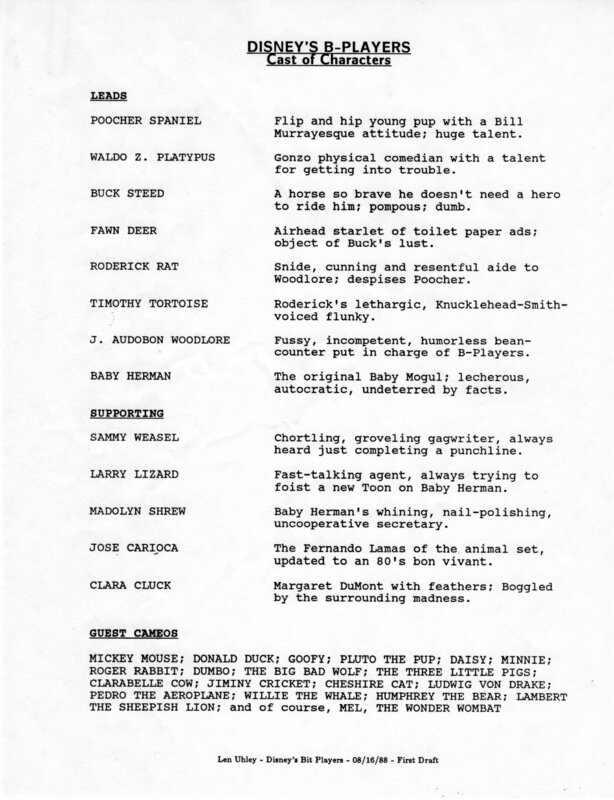 After coming up with a cast list on Aug 18th, 1988, we held another brainstorm session to nail down the main characters. Here are some excerpts from a transcript of that conversation. LU: You got your dog, you got your platypus. You got your not-an-ostrich. JM: My favorite animal, the non-ostrich. LU: You don’t want Sammy Platypus. 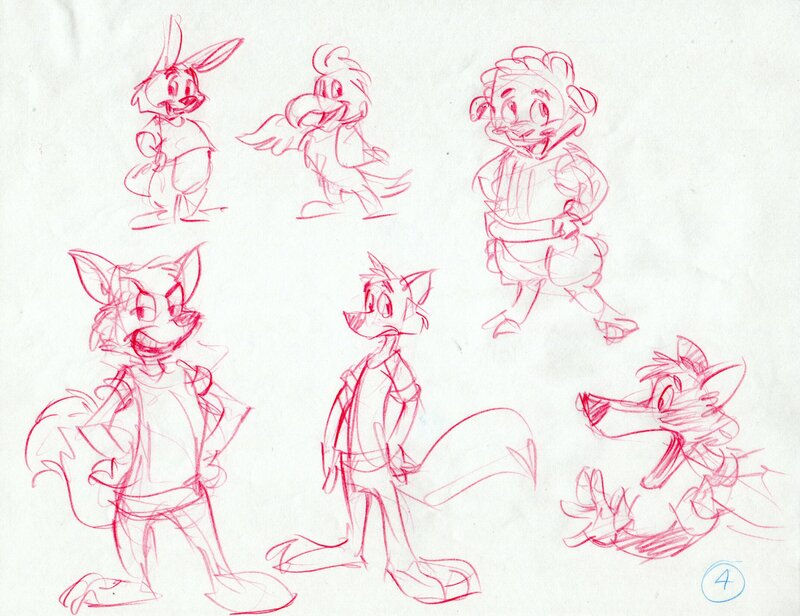 JM: I’m not saying I don’t, I just… Look, when we went to sell Rescue Rangers, we had all these characters, and it was a funny lizard and a funny rat, [however] at the head of the whole thing was this macho character called Colt Cheddarson. [Sadly, the reaction from Management was], “Yeah, he’s good, that’s nice,” but it wasn’t like, “Yow! This guy’s gonna be a star!” I just don’t feel like there’s anyone here. I know they’re B-Players, [but] there are no stars here. LU: Well, then bestow upon me your wisdom with respect to what the lead should be, and I don’t mean dog or chicken or whatever, but I mean, I’m missing what you feel is missing. LU: My question, do we need to take an established Disney character, just like we did with Chip ‘n’ Dale? There it is, folks. The realization that we needed someone BIG who would front the show. But who could it be? We couldn’t use Mickey or Goofy, cuz they were A-Players. 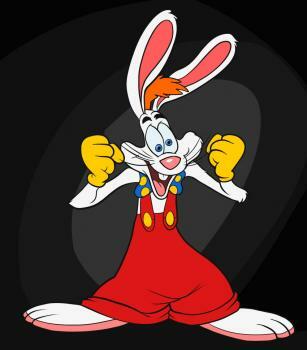 We wanted someone vivacious like Roger Rabbit or silly like Bullwinkle J. Moose. But we couldn’t think of anyone like that. So then we started thinking about comedy teams – Abbott & Costello, Rocky & Bullwinkle, Laurel & Hardy, Laverne & Shirley. One smart, one dumb. LU: Two idiots. Maybe we do need to think along the lines of — cat and mouse. Think about it. You have a big, well-meaning sheepdog and you have a slightly more clever cat. Ah-hah! See where this is going? The door is opening for a bear and a rat! he’s the star; he gets top billing, but you know the funny one is the other one. LU: So basically we’re doing Roger Rabbit and Humphrey the Bear. That’s the problem. We’ve got to find a talking Humphrey the Bear. Hmmm… who could that be??? Anyway, Len and I went on to discuss Hope & Crosby, plus Asterix & Obelisk. Inseparable buddies. JM: When I was working with Mike Post, we created a rock & roll band [called Halyx for Disneyland]. And one of the things that Mike said was, “When you watch the Beatles, there is an instant rapport when two of them sang off the same microphone.” There was a camaraderie there that you couldn’t sell with tons of words; all you had to do was see them. It instantly gets me thinking about the way that Butch and Sundance would jump onto the same horse and ride off. That even though you knew they were completely separate people and would go their separate ways, there was an understanding [between them]. 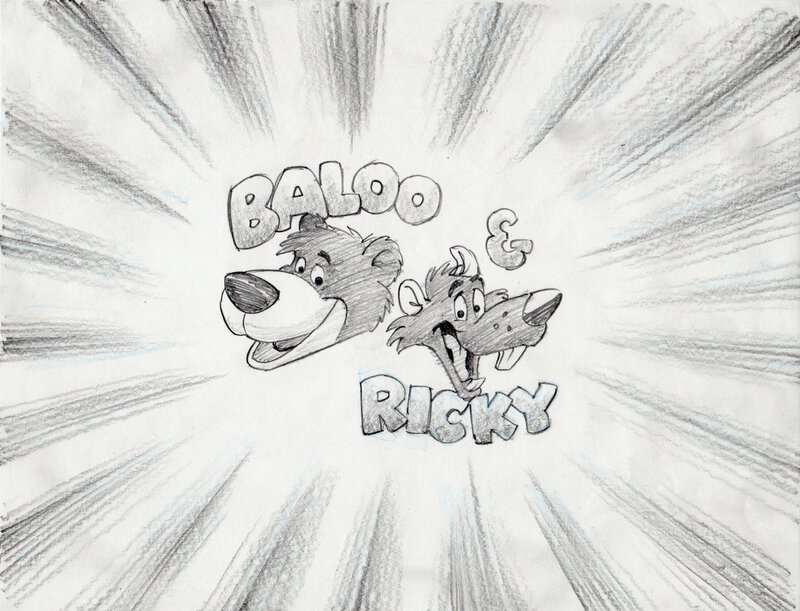 Admittedly, we never achieved that kind of relationship with Baloo and Ricky, but it’s interesting to note that this friendship blossomed later with Baloo and Kit Cloudkicker. She was definitely going to be in the cast. LU: Okay, let’s take it down to characters of ours for a sec. 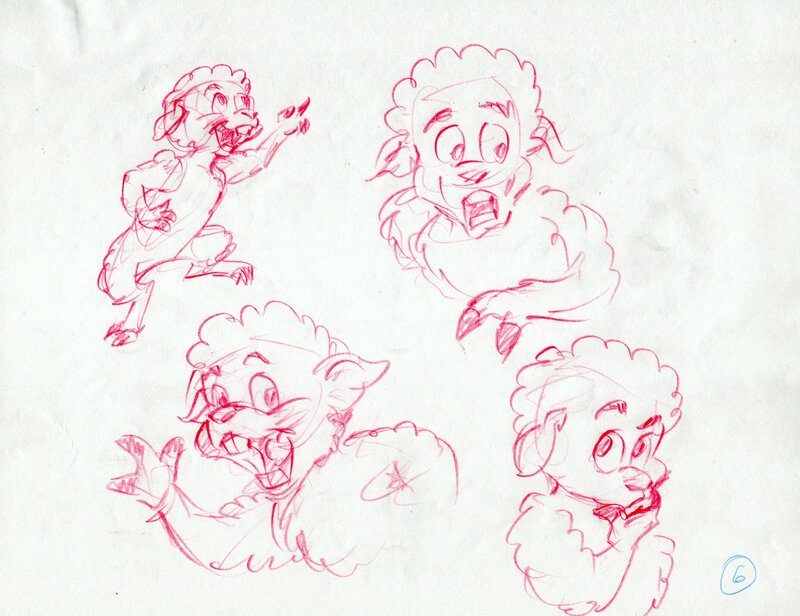 Maybe it’s Gusto [Gummi] and Tummi – as different animals, of course. JM: Tummi to me is John Candy in STRIPES. He’s a complete sidebar. He’s not part of a team; he’s funny on his own. LU: That kind of “Let’s go out and do something wild” stuff conforms to what you’re talking about for our lead in this. He’s a little more firmly rooted than Gusto, but not by much. 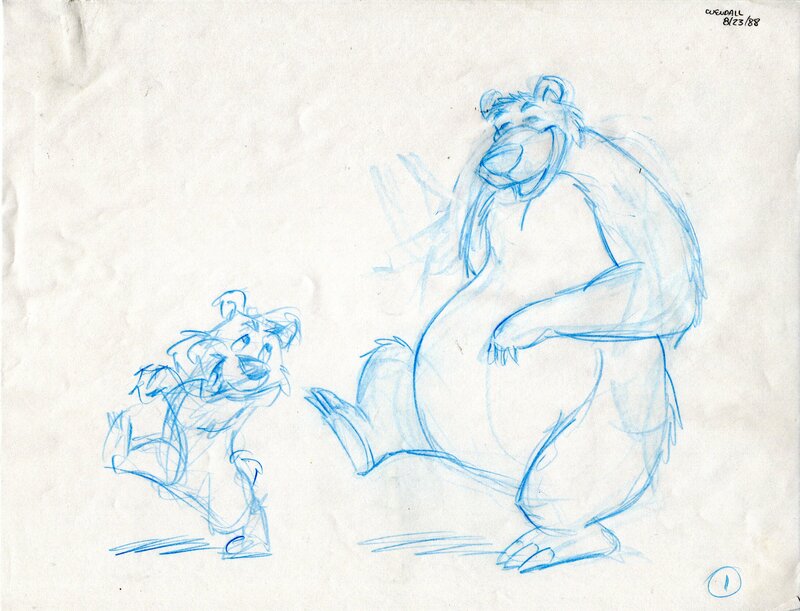 JM: All right, if that’s what you want… Baloo the Bear. You’ve got the big dog thing. Make him a B-Player just the way he is. He’s a perfect B-Player. It’s very much like Roger, “I just want to entertain, I just want to be myself,” you know? He can’t see past that. LU: Okay, let’s use him. That’ll satisfy Eisner. [Then we] create a new character, and he’s playing with Baloo the Bear. JM: [Eisner] will never let us have him. JM: Not unless we suggested we do JUNGLE BOOK as a TV thing. God, that would be great. Wait, isn’t that Tale Spin? Jungle Book in the sky? Ha-ha-ha! LU: Okay, you sell it as, it’s Baloo – as a St. Bernard. JM: Yeah, you don’t make it Baloo; you do exactly what they did in ROBIN HOOD. They’re never gonna do Robin Hood as a series. Make him Little John. Same character. And it was Phil Harris doing the [same] voice, and it was the big, fat, dumb bear, you know? LU: He’s be a great B-Player. Don’t shake those money-makers, or the money will fall out! JM: That’s it! Milton Berle starring in the B-Players. LU: That’s right. He’d love that, wouldn’t he? The kind of thing where he’d do anything for a laugh – no shame. JM: Hope and Crosby. Baloo would be Crosby. 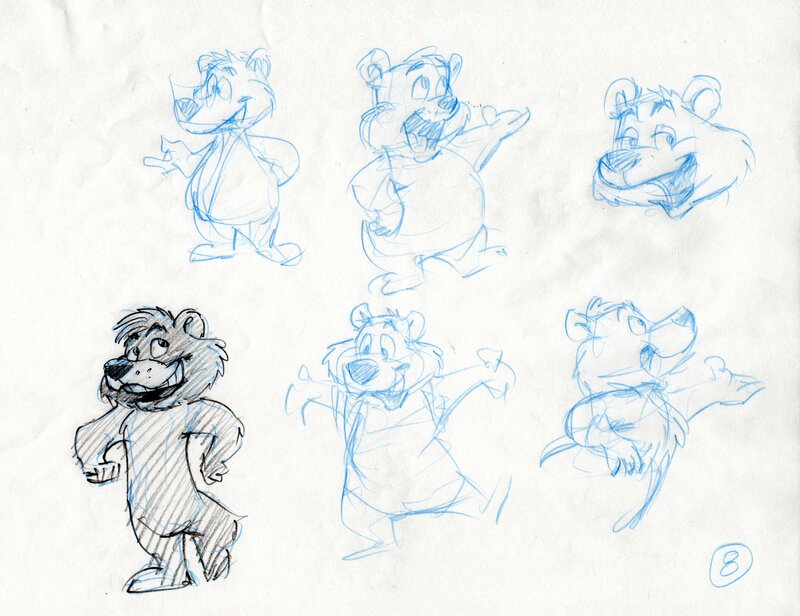 More laid-back, the bare necessities. He likes things to come easy – never has to work at it. Baloo would go up to a tree and bump it with his hip, and the bananas would fall into his lap. [Or] he would send [Bob] Hope up the tree. That was the end of that day’s brainstorm session. As you can see, Baloo had fallen into place. Now we had to figure out his sidekick, his buddy, his pal… And that’s tomorrow. Many die-hard fans already know that there was once a show in development at Disney TV Animation called “B-Players.” I’ve often mentioned it as the precursor to “Tale Spin,” since the demise of former led to the latter. 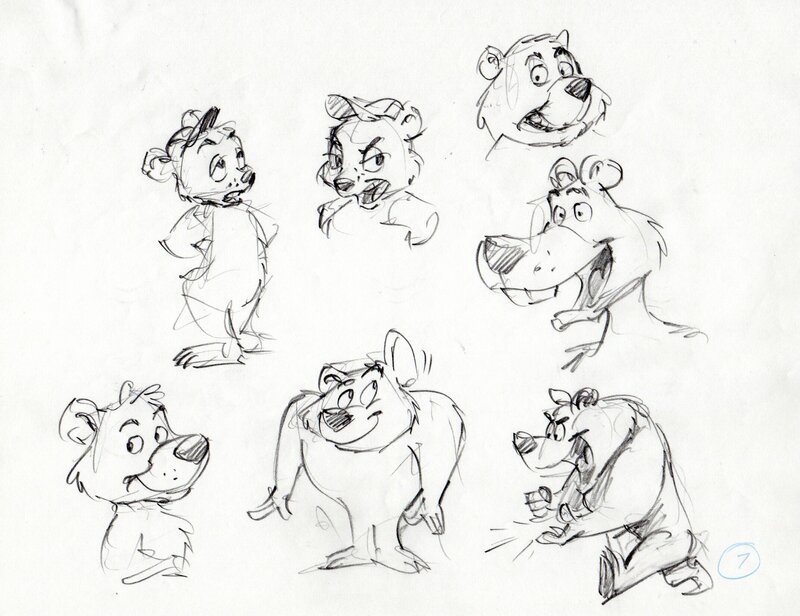 Baloo was the star of B-Players, and after the development was killed, Baloo made the transition to Tale Spin with great ease. (He’s a great character, ain’t he?) But that’s about as much as I’ve ever revealed. 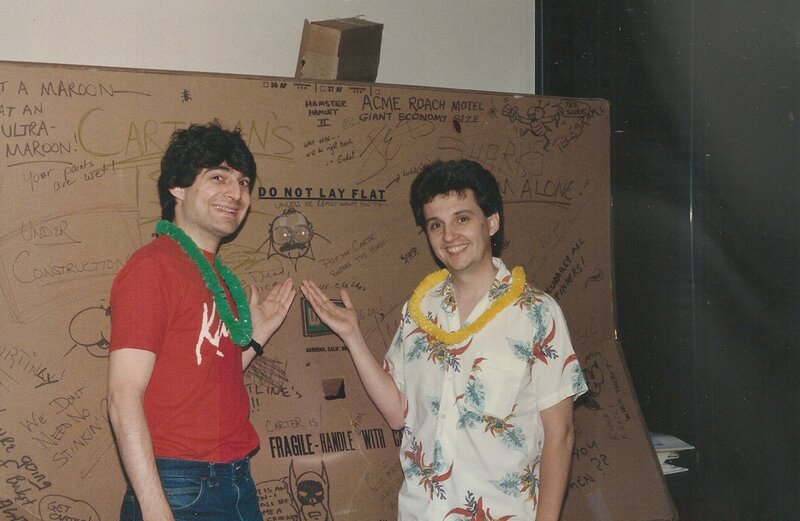 Actually, the development of B-Players was a fast and furious endeavor, because in order for TV Animation to jump onto its next 65-episode series (and keep everyone at the studio employed), we needed to sell B-Players at a big corporate meeting in Florida in early Oct’88. Good enough for a team logo! 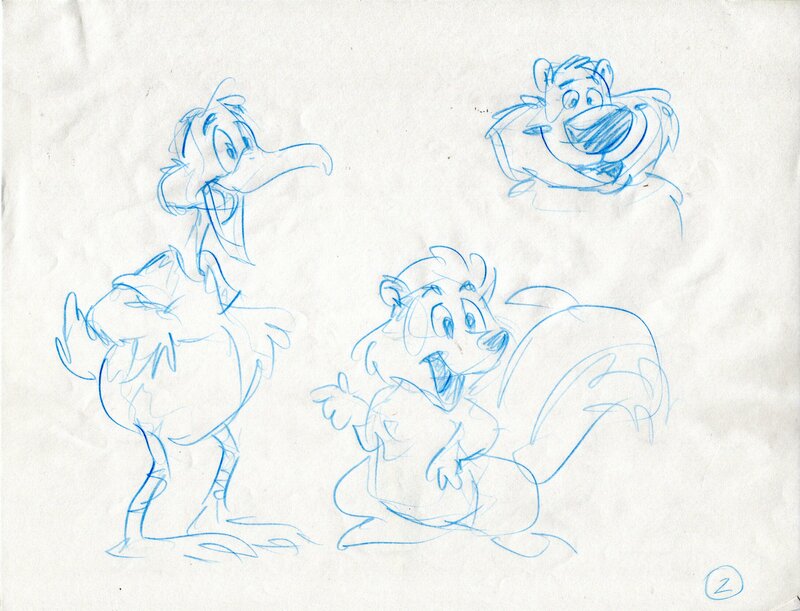 So I’m going to devote several blogs to the lost history of “B-Players.” I think you’ll find it interesting to watch the creative process, as well as observe how this series fit into the history of TV Animation. 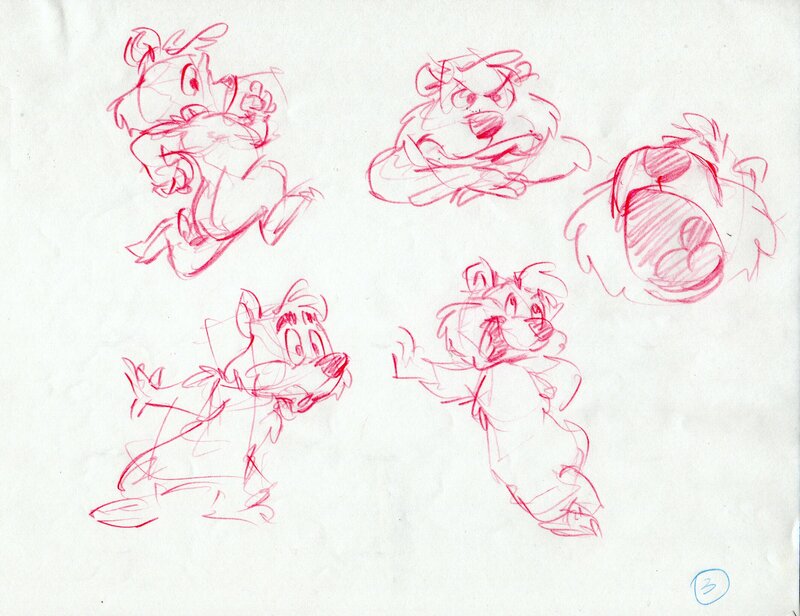 OK, some backstory… By Summer 1988 TV Animation had created numerous hits in its brief 4-year history: “Gummi Bears,” “Duck Tales,” “Rescue Rangers,” “Winnie the Pooh,” etc. We were falling into a pattern in which showrunners were on a revolving track. When production on a series ended, the creative team would swing into Development Mode, coming up with the next series to be produced. That’s where I found myself in August of ’88… looking for the next 65-episode syndicated hit. And there’s where B-Players begins. OK, this is a later time… a Tale Spin time. But it’s still Len and me, so cut me some slack. 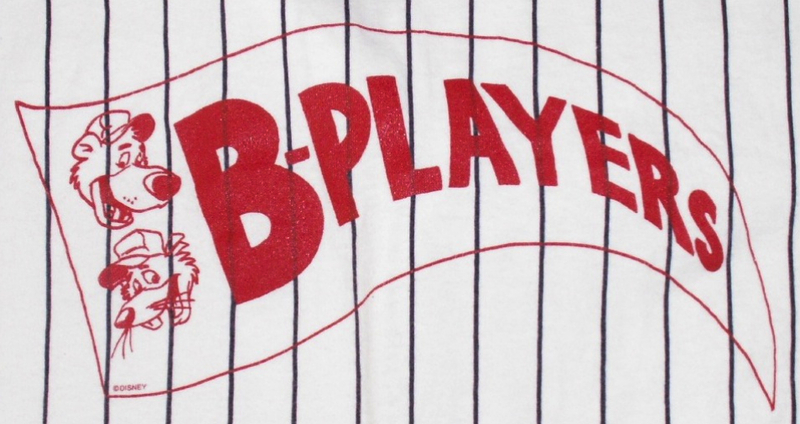 Len Uhley and I were the first two show developers of B-Players. 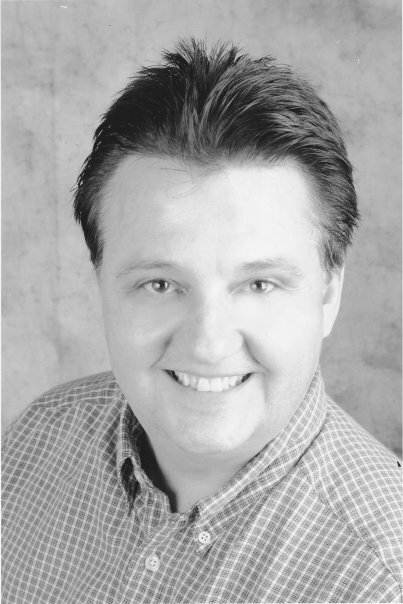 (Len joined the Disney team when I hired him as a staff writer on Gummi Bears, and he worked for years at TVA as a power hitter on almost every series.) Obviously we had done some preliminary thinking on this series, but the earliest development I can find is the first draft of potential characters, typed up by Len on August 16, 1988. I include it here with delight. I love that Jose Carioca shows up as a “Fernando Lamas” character — decades before the suave Puss (Antonio Banderas) of Shrek fame. (OK, OK, Carioca is Brazilian, I know, I know.) Also, the platypus is now labeled as Waldo Z. which was pet name that Mark Zaslove and I used. [It comes from a 60’s episode of Steve Allen’s afternoon talk show where Steve took comment cards from the audience. 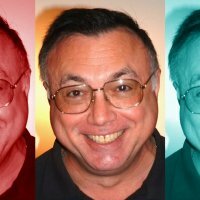 One guy wrote, “My dog’s name is Waldo Zibaldo.” When Steve queried the audience member why he named his dog in such a bizarre manner, the guy shrugged and said, “Cuz my name is Fred Zibaldo.” Years later I brought that name to Disney, and Waldo Zibaldobecame an all-purpose moniker… which Mark and I still use to this day, in fact.] But most importantly, Len named the evil character “Roderick Rat.” Interestingly, that rat character would eventually evolve from villain to main character — Ricky Rat. In A Nutshell: The series revolves around gung-ho cartoon character (a la Roger Rabbit) who is trying to inspire his fellow toons to lobby for more jobs, more screen time. He is very plucky but a bit naive – like Rocky the Flying Squirrel or the early Mickey Mouse. A cheerleader, hoping to inspire his fellow bit player toons to greatness — to quit their hiding on the back lot and get working again — to make great cartoons once more with their incompetent director. Wait, what incompetent director??? Well, at this point we were discussing J. Audubon Woodlore as the nice-but-fumbling comedy director. He likes the Bit Players…. but his Assistant Director is the villain of the piece! An angry, conniving AD (a la Black Adder) who despises working on comedies with these has-beens. [This is a dynamic that was never played out in Gummi Bears – in which Duke Igthorn has to play second-banana to an more powerful (yet stupid) villain named Lord Zared. Very frustrating to Iggy. And again, a very similar situation to Black Adder.] At this stage of the talks the main character (who we were calling Roger for shorthand) and his cronies are all good guys, but it’s this evil AD that is the guy trying to trip them up – a spiteful, petty, turd. You see, the AD signed an 86 picture deal with Disney, but they won’t let him direct (because he’s not a real human… like Goofy…. a human body but a dog or fox head). So the AD has to suffer through all these horrible 2-reeler cartoons under Woodlore’s directorship. Grrrrrrr. THAT’S why the Black Adder character hates our toon characters. 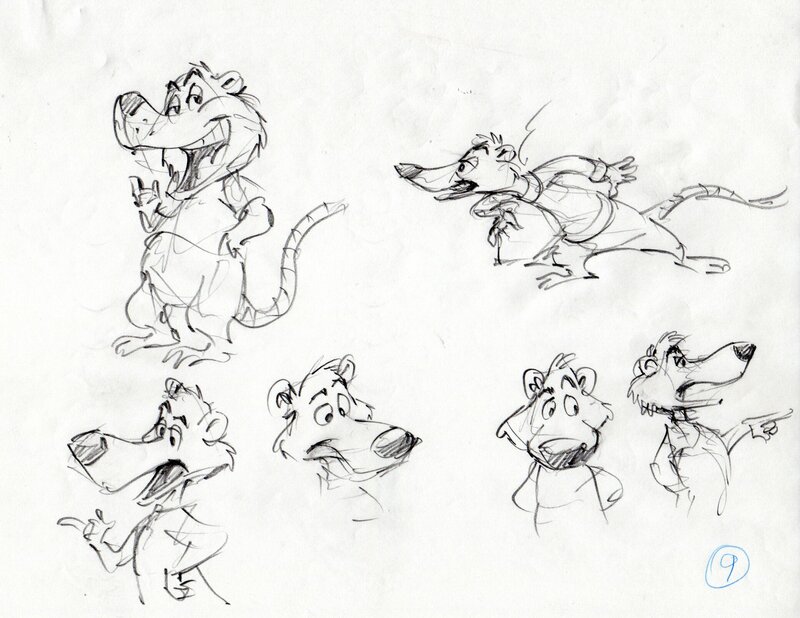 So our lead character “Roger” is this talented, caring dude who looks out for his fellow toons. 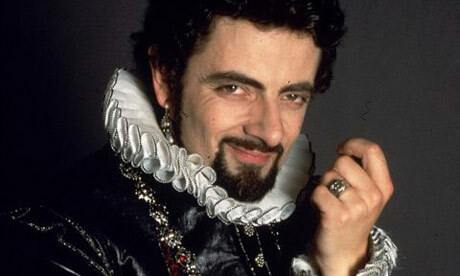 Like when a stupid toon gets his head stuck in a bucket of cement, the Black Adder character wants the lummox fired! But it’s Roger who convinces Audubon to “shoot around him” until the cement dissolves. Or better still, “Roger” dresses up and fills in for the missing actor so he’s not fired. 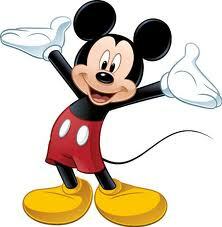 His role model is Mickey (who he hopes to co-star with some day), but he’s not as talented as the Mouse. So he’ll stoop to any level to get a laugh. “Can’t juggle and unicycle at the same time? Then I’ll smash a plate over my head!” He wants stardom reeeeeeally bad. OK, the villain seemed to be pretty clear cut, so we wrestled with what type of character the lead was going to be. Roger and Bugs had the rabbit thing sewn up. “We can’t do a mouse,” said Len, who then suggested a dog. Dogs are better than cats (as cartoon heroes), but bears “give me a heavy feeling.” [Again, it’s fascinating to note that in this story walk we turned down a rodent and a bear… who would BOTH eventually become the leads of B-Players!!!] 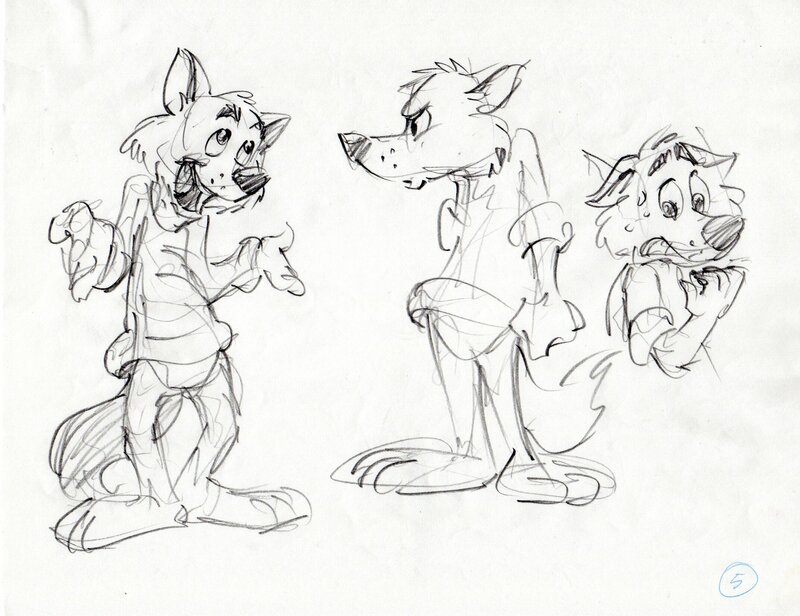 At one point Len referred to this dog character as Peter Pointer. The story walk ended here, but the wheels kept turning. On Aug 18th Len typed up a second draft of the “Cast of Characters,” and you can see the influence of the Story Walk. We took the list of characters to designer Wendell Washer (http://www.wendellwasher.com/) who quickly drew up a bunch of supplementary toon characters. A few days later, he turned in 9 pages of stuff.